Blog | DreamCarrierThreads | Making your Dream Carrier a reality! I wanted to let everyone know i’m closing for new orders until 6/1. I am still working on completing the Neo 2.0 testers, which were scheduled to be done a month ago. I apologize for the delay and my lack of foresight. I should’ve allotted extra time for redrafting patterns, etc. I am so sorry. I will be emailing all remaining testers today. I am also two weeks behind. I have two weeks of Aprils orders left, which will push everything back two weeks. So if you have an upcoming order, there will likely be a delay. In the future I will be limiting the number of applique slots to TWO per month. They are much more time consuming, which takes away from my normal carrier sewing time and things fall behind. I will not be stocking any custom slots until 6/1, and that will be for July custom slots. I wanted to post an update about customs, slots, how to get them, etc. After that, the next slots for June will stock at the beginning of May. For exact stocking dates and times, please check back here or on my Facebook page. I do not have a wait list open at this time. I am auctioning off my personal Dream Carrier. It is made out of a Girasol Double Rainbow wrap, turquoise solarveil, and my favorite elephant print. It is reversible. 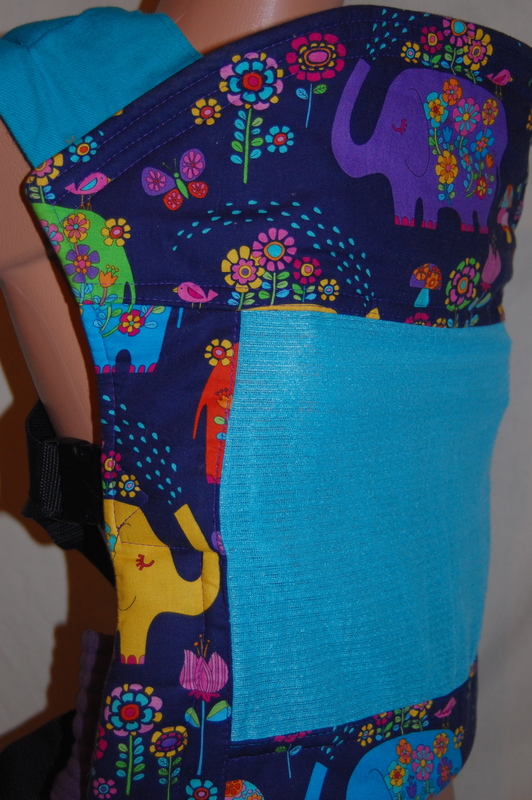 It also has dual tone straps, turquoise shoulder straps and a purple waist strap. The straight waist is padded for approx 26.5in and has an additional 10in of webbing on each side, giving a total length of 46.5in. It has a 2in dual adjustable waist buckle. This carrier can be worn apron or non-apron. I wore it both ways, depending on my girls size/age. 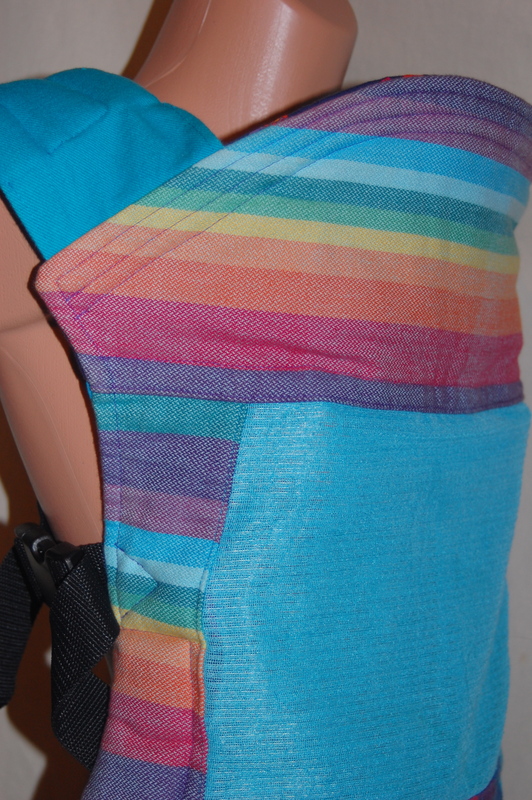 The straight shoulder straps are 17.5in long plus an additional 24in of webbing on each side. 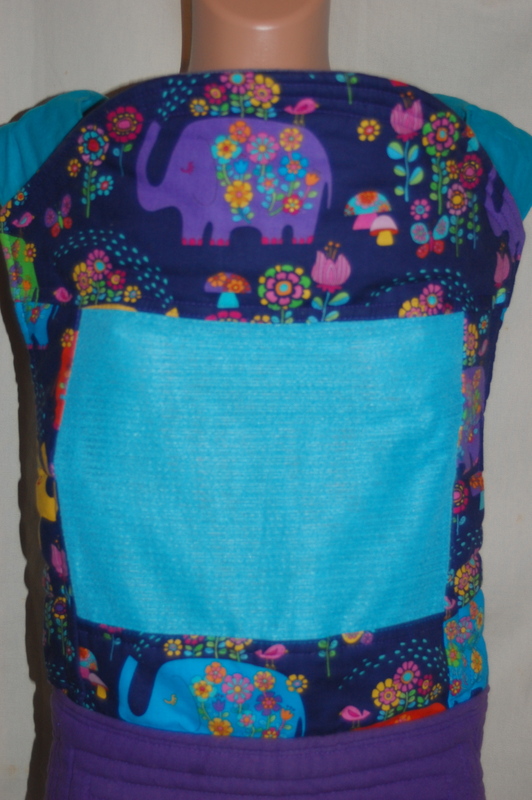 This carrier comes with an elephant fabric chest strap. The carrier body is 18in tall & 17in wide. I used it last summer with my 18mo old. It still fits her well and she is 28mo old. I am only selling due to many unforeseen expenses. To bid on this auction, comment below with your bid. Please bid in $10 increments. I will be closing this at 9am CST Monday morning. The opening bid will be $195. Shipping is not included and will be the exact shipping cost to be paid by the winner of the auction. Should the winner back out, I will move on to the next highest bidder. Thank you for looking & happy bidding! I am currently closed for any new orders. I will be working on the March and April custom orders as well as the Neo 2.0 testers. I anticipate reopening in May, and will announce here and on my Facebook page when I do. I just wanted to update everyone as it nears February. I will still be coming out with a new Neo model in the next couple months, I do not have the design finalized and will be testing it out more before finalizing it and sending it out for testing. So until further notice, I will still be offering all models of Dream Carriers. (half buckle, full buckle, mei tai & Neo) And all Neo’s made are still the original version. I love New Year’s day. I love the start of a new year. A blank slate. I love looking back and reflecting on the previous year, especially when it comes to my business. I love seeing where I could improve, and i’m always trying to do better. So for 2013, I have decided to keep a much smaller queue. I am hoping to cut the wait time down to 2wks. There are going to be big changes coming in 2013 & I’m excited to get started on them! We will be releasing a new Neo model(Neo 2.0) in February 2013. Or as soon as testing is done, however long that takes. We will only be offering the Neo 2.0 starting in February 2013. 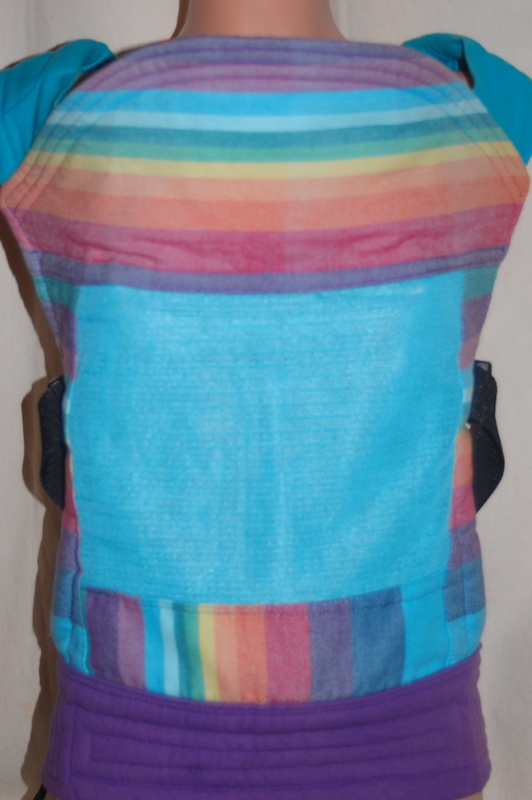 You will still be able to customize it, send in your own fabric or wrap and get different body sizes. I just will not be offering any other models at this time. I’m sorry for any inconvenience. From all of us at Dream Carrier Threads, Happy 2013!! ❤ May you have a blessed year! This will be stocking tomorrow 12/31 at 9am CST! As i’ve been finishing up orders for the year, i’ve been thinking about how I would like to stock custom slots this new year. I plan to stock 2 slots a week. Monday will be a slot available for anyone to purchase. Tuesday will be a slot for New Customers. I am still working through my wait lists that I started this year. The fall wait list has almost nearly been contacted. The Winter list will start being emailed in February. I will announce here on my blog & on Facebook when I open the new list. This list is effective immediately for any new orders as of 11/26/2012. Please note, this is for NEW orders only. If you have a custom in the works and have paid a down payment, then I will be using the old price list for your custom due balance.